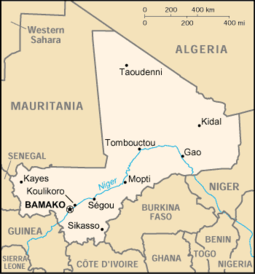 Mali, officially the Republic of Mali (French: République du Mali, Amazigh: ), is a landlocked nation in Western Africa. It is the second largest country among West African nations, after Nigeria. It borders Algeria on the north, Niger on the east, Burkina Faso and the Côte d'Ivoire on the south, Guinea on the south-west, and Senegal and Mauritania on the west. Its straight borders on the north stretch into the centre of the Sahara desert, while the country's south, where the majority of inhabitants live, features the Niger and Senegal rivers. Formerly French Sudan, the country is named after the Empire of Mali. The name of the country comes from the Bambara word for hippopotamus (with the animal appearing on the 5 franc coin), the name of its capital city comes from the Bambara word meaning "place of crocodiles". The Mandé peoples settled the Sahel (including present-day Mali), and formed a succession of Sahelian kingdoms, including the Ghana Empire, the Mali Empire, and the Songhai Empire. 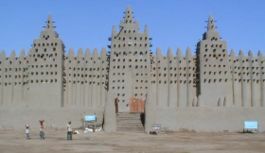 Timbuktu was a key city in these empires as an outpost for trans-Saharan trade and a centre for scholarship. The Songhai Empire declined under a Moroccan invasion in 1591. Mali was invaded by France starting in 1880, which annexed it as an overseas department of France. The colony, which at times also included neighbouring countries, was known as French Sudan or the Sudanese Republic. In early 1959, the union of Mali and Senegal became the Mali Federation, which gained independence from France on June 20, 1960. Senegal withdrew from the Mali Federation after a few months. The Republic of Mali, under Modibo Keïta, withdrew from the French Community on September 22, 1960. Modibo Keita was victim of a coup in 1968 after which Mali was ruled by Moussa Traoré until 1991. Anti-government protests in 1991 led to a coup, a transitional government, and a new constitution. In 1992, Alpha Oumar Konaré won Mali's first democratic, multi-party presidential election. Upon his reelection in 1997, President Konaré pushed through political and economic reforms and fought corruption. In 2002 he was succeeded in democratic elections by Amadou Toumani Touré, a retired General, who had been the leader of the military aspect of 1991 democratic uprising. Under Mali's 1992 constitution, a president is elected for a five year term as chief of state and commander in chief of the armed forces. This president appoints the prime minister and chairs the Council of Ministers, which adopts proposals for laws submitted to the National Assembly for approval. The constitution further defines Mali as being a multi-party democracy, and prohibits parties based on ethnic, religious, regional, or gender lines. The National Assembly is the sole legislative arm of the government, and currently consists of 147 members. The term of office for members is five years. Eight political parties are currently represented in the Assembly, and are aggregated into four parliamentary groups. ADEMA currently holds the majority among these groups. Mali is divided into eight administrative regions, which are themselves further divided into districts. These districts are composed of communes, which contain villages. Since decentralization plans began, a total of 702 local municipal councils have been formed. These are headed by elected mayors. The Malian legal system is largely defined by the country's former colonial status under France. Moves have been made to change this system to closer conform to the actual culture of the country, but many laws of the French era remain in effect. The judiciary is defined by the constitution as being an independent body. Currently, judges are appointed by the Ministry of Justice. Mali has both a constitutional court, and a high court of justice. The latter is empowered to try government officials in cases of treason. Mali is divided into 8 regions (régions) and 1 district, and subdivided into 49 cercles and finally 288 arrondissements. At 478,734 mi² (1,240,000 km² ), Mali is the world's 24th-largest country (after Angola). It is comparable in size to South Africa, and is nearly twice the size of the US state of Texas. 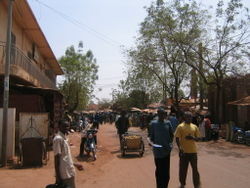 Mali is landlocked and has a subtropical to arid climate. It is mostly flat, rising to rolling northern plains covered by sand, with savanna around the Niger River in the south. 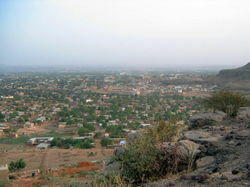 The hills of the Air Massif and Djado Plateau lie in the northeast. Most of the country lies in the Sahara Desert, which produces a hot, dust-laden harmattan haze common during dry seasons and leads to recurring droughts. The nation has considerable natural resources, with gold, uranium, phosphates, kaolinite, salt and limestone being most widely exploited. Mali is among the poorest countries in the world, with 65% of its land area desert or semidesert. Economic activity is largely confined to the riverine area irrigated by the Niger River. About 10% of the population is nomadic and some 80% of the labour force is engaged in farming and fishing. Industrial activity is concentrated on processing farm commodities. Pottery is also practised by women whose wares are bought by dealers and are transported to markets where they are sold by traders. The traditional methods used by the potters are an attraction to foreign tourists. Mali is heavily dependent on foreign aid and vulnerable to fluctuations in world prices for cotton, its main export. In 1997, the government continued its implementation of an IMF-recommended structural adjustment program. Several multinational corporations increased gold mining operations in 1996- 1998, and the government anticipates that Mali will become a major Sub-Saharan gold exporter in the next few years.